If you love flan, you will love this dessert. 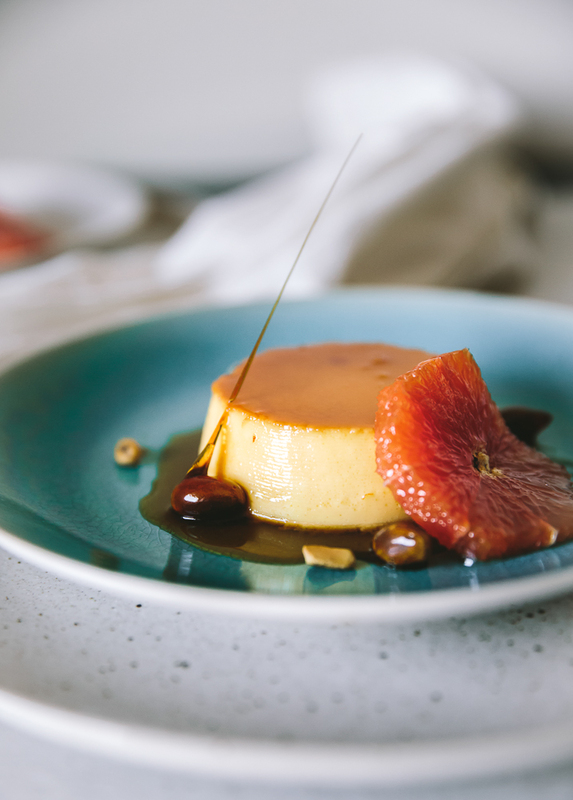 This saffron cardamom infused flan has subtle floral notes and is extremely delicious! I love to play around with different flavor profiles, especially those that I don't cook with often. I've been having some saffron in my cabinet just sitting there and then the light bulb went off! The base for this recipe comes from one of my favorite female chefs, Suzanne Goin. I loved the ease of just opening up some cans and placing the contents in the blender for a quick buzz. Believe it or not, saffron is used in a lot of desserts, not just paella. It has a subtle yet distinct flavor profile that needs to be used sparingly, especially considering the price tag. For this desert I paired saffron, cardamom and orange to kick up a notch the delicious creamy custard. Served it alongside some candied and roasted pistachios, as well as some orange slices. The candied pistachios are an option. I was just testing out a trick I saw on Instagram, but roasted pistachios will do the trick. To supreme an orange, this link from Martha Stewart is a great guide. You will also see a picture of me torching some oranges, but again, just me having fun with some of my toys! If you love bold flavors and want just the right amount of bold flavors in your face, then you would love this dessert. Its creamy, decadent and delicious! The slightly burnt caramel syrup spares nicely with the semi-sweet custard. Next time I will add a little dollop of whipped cream, since it is not overly sweet. Preheat the oven to 300 degrees. Gather eight ramekins and place aside. In a medium-sized saucepan, stir together the sugar and 1/4 cup of water. Bring to a boil over medium heat without stirring. Cook for about 10 minutes, until the sugar caramelizes and becomes deep golden brown. Pour about 1 1/2 teaspoon of caramel into each of the ramekins. Swirl them around to make sure to evenly coat the bottom. Pour the evaporated milk into a small pot over medium high heat. Add the saffron and cardamom pods. You want to bring the temperature up, but not to a boil. Cover and let steep for 5-8 minutes. Strain and let cool. Pour the condensed milk, evaporated milk, vanilla extract and eggs into a blender and mix at high speed for a few seconds until everything is incorporated. Pour the mixture through a strainer into a bowl. Stir in the orange zest and then pour into the prepared ramekins and fill each one just below the rim. Place ramekins into a large roasting pan and pour hot water into the pan until it comes halfway up the sides of the ramekins. Cover whole pan with foil and place into the oven. Bake for 1 hour until set. Remove from the oven, uncover and let cool in the water bath for 15 minutes. Refrigerate for at least 2 hours. Run knife around the edges and turn each custard onto a plate. Serve with toasted pistachios and orange supreme. It's that time of year, Mardi Gras y'all! Now is the time you see endless King Cakes taking over the grocery stores. Purple, green and gold everywhere around the city and surrounding cities. This Mardi Gras King Cake has a delicious praline glaze and is stuffed with cream cheese. Did y'all even know that King Cake is not actually a cake? Its really a bread-like-cinnamon-rolly-delciousness going on. I remember Mardi Gras being a time of joy and absolute FUN. Even though it has been years since I've been back home during the festival season--yeah I know, long overdue--but I will never forget the energy of the city. If you have never been, you need to experience Mardi Gras at least once! The inspiration of this King Cake came from pastry chef Lisa Marie White from her famed Domenica King Cake. The brioche dough is rolled with a cinnamon sugar sprinkled with orange zest and then a mascarpone cheese filling that is sweetened with just a little powdered sugar. Once baked, a praline glaze is poured over it and also your regular icing glaze. I decided to not cut the cake in half and stuff it but just roll the cream cheese filling into the dough. It still came out delicious! Never would I have thought I would be making King Cake, but soooo glad I did! In the bowl of a stand mixer fitted with the paddle attachment, add cream cheese add mascarpone and beat until smooth. Scrape down sides once again. Add salt and sugar, and mix until combined. Place in a piping bag and refrigerate until chilled. In a medium saucepan over medium heat, combine brown sugar and butter. Cook until the sugar is melted and mixture is bubbly, making sure to not stir too much. Slowly add cream, and whisk until thoroughly combined. Be careful, mixture may splatter. Whisk in corn syrup and molasses. When mixture is ready, it will have a velvet sheen. Keep warm until using. In the bowl of a stand mixer fitted with the paddle attachment, add brown sugar, butter, 1 teaspoon cinnamon, and ½ teaspoon orange zest. Beat until combined, and set aside. In a large bowl, place warm milk; add sugar, yeast, and a heaping tablespoon of flour, and whisk until sugar and yeast are dissolved. Let stand until foamy. Whisk in the melted butter, eggs, vanilla, and remaining 1 teaspoon orange zest. In a separate large bowl, combine nutmeg, remaining flour, and remaining 3 teaspoons cinnamon; fold flour mixture into the milk mixture with a large rubber spatula. After the dough comes together and pulls away from the sides of the bowl, shape it into a large ball. Knead dough on a well-floured surface until it is smooth and elastic, about 15 minutes. Return dough to bowl, and cover with plastic wrap; set aside in a draft-free place until dough doubles in size, about 1 ½ hours. Punch dough down, and roll dough out to a ¼-inch thick rectangle (about 20x12-inches). Lightly spread with reserved brown sugar mixture. On one end, pipe the cream cheese mixture starting 1/3 from the top of one end all the way down stopping 1/3 from the end. Roll up long side of dough as tightly as possible, like a cinnamon roll, and pinch ends closed. Shape it into an oval shape, and tuck the ends under each other. Line a rimmed baking sheet with parchment paper, and spray lightly with cooking spray. Place dough on prepared baking sheet, and let rise until doubled in size, 30 to 45 minutes. Let cake cool and drizzle some parts with the praline glaze and others with the icing glaze. Sprinkle with decorative sugars and enjoy with a cup of coffee! This recipe is adapted from Louisiana Cookin Magazine. Why hello November! Is it me or did this year just past by super quick? It is already that time of year where everyone sees and breaths pumpkin mania! Sorry, but it is here and I have probably had 5-6 Pumpkin Spice Lattes from Starbucks already. But these old fashioned pumpkin donuts really need to be in your life. I made them twice already and think you should too! It is very sticky. So make sure you spray your bowl and plastic wrap with non-stick spray. The recipe is adapted from Chef Steps and I really love their recipes. They use to focus mainly on sous vide items, but I'm glad they are expanding their recipes and techniques. The first time I made the recipe my batter was not cold enough when I started to fry, so it is important that it is cold so that the oil does not seep though. We don't want no oily, soggy donuts now. So, it is crucial to stick them in the refrigerator for at least 20 minutes until ready to fry. They came out perfect! Crispy exterior and spiced cake-like center. These will be a hit with your family on a cold morning with a cup of coffee or hot coco. I even did my first video!! Yay me! Sorry its not the process, it was very much a last minute decision. Sometimes you will wait for the so called "perfect" time but really just need to just do it! Combine the milk salt and powdered sugar into a mixing bowl. Mix until will combined and smooth and creamy. Cover with plastic wrap and place aside. Sift together the pastry flour, baking powder, kosher salt and place aside. Combine the sugar, yolks, and butter in the bowl of a stand mixer fitted with the paddle attachment. Set the mixer to high and mix for about two minutes. Stop the mixer, add the sour cream and pumpkin puree. then mix on medium until the mixture becomes smooth, about one to two more minutes. Lightly coat the inside of a medium mixing bowl with nonstick spray, line the bowl with plastic wrap, making sure to press the wrap inside the bowl. Coat the exposed plastic wrap inside the bowl with another layer of nonstick spray. Set the bowl aside. With the stand mixer set to low, add the dry ingredients and pumpkin pie spice to the wet ones, one large spoonful at a time, waiting a few seconds between spoonfuls and stopping the mixer when the dry ingredients are completely incorporated. Transfer the dough to the bowl lined with plastic wrap; spray the top of the dough with the nonstick spray; cover it, placing the ends of the plastic wrap directly on the dough; and put it in the refrigerator for 60 minutes. Line a half-sheet pan with parchment paper, coat the paper with nonstick spray, and set it aside. Lightly dust a work surface with flour. While the dough is still in the bowl, dust the top with flour, then transfer it from the bowl directly onto the floured work surface. Working quickly to keep the dough cool, lightly dust the top of the dough with more flour. (You can always add more if you need it later.) Roll to about a half-inch thick. Brush any excess flour from the surface of the dough. Use a 3 inch and a 1 1/4 inch ring mold to punch out your donuts, dipping the bottoms of the molds in flour before every cut. Make donut holes from the middles! In a large pot over medium heat, fry oil to 340 °F / 170 °C. Clip a thermometer to the edge of the pot and monitor the temperature regularly, stirring occasionally to keep the heat even. Cooking one at a time until you get the hang of it, place a donut in the fryer. Once it rises to the surface, cook it for 40 seconds, then use a spider strainer or slotted spoon to flip it and fry until the bottom develops a nice, golden-brown color, about 80 seconds. Flip it one more time and fry for another 80 seconds. Transfer to a rack over a metal tray or onto a paper towel-lined plate. Let cool for 10 minutes and then drizzle glaze over. Apple galette with crystallized ginger and spices! Yes please! Oh, and we cannot forget the creme fraiche ice cream! Yes, creme fraiche! The ice cream recipe came from Marc Forgione's cookbook, which I love. The creme fraiche adds such a subtle tanginess that is just creamy and delicious and pairs perfectly with the apples and buttery crust. This has been on my list of things to make. Y'all, I truly truly am bad at baking! Just me trying to get the pie dough right took a lot of flour and butter, some thrown in the trash or just the final dish not eaten. But, with determination and after the 5th try, I finally got it! How amazing are these beautiful apples? Usually when buying apples I stick to my favorite, Honey Crispy, but for this apple galette recipe I wanted a mixture of 2-3 different apples. So, I saw these cute little apples and to my surprise the flesh was a beautiful pink hue. They are called Pink Peals and have a tartness to them similar to Granny Smiths. The apple galette filling is quite straightforward. I wanted some texture, so I decided to add diced crystalized ginger and some bold spices--such as star anise, ginger, clove, nutmeg and cinnamon. I can't wait to make this again! Especially the creme fraiche ice cream--its my new go to! In a pot over medium heat, combine the cream, milk, sugar and creme fraiche, bring to a simmer. Stir mixture to prevent liquid from burning. Remove from heat. In a medium bowl, whisk together the egg yolks. Drizzle about one-third of the warm milk mixture into the egg yolks. Whisking constantly to temper them. Return the tempered egg yolks to the pot with the remaining milk. Cook over low heat as it warms and thickens, 5-8 minutes. The custard should coat the back of a spoon. Place bowl over an ice bath and stir the custard until it is cool to the touch. Cover and refrigerate overnight. Transfer the custard to an ice cream maker and process according to the manufacturers instructions. Freeze for at least 2 hours or until firm. In a bowl mix together the apples, brown sugar, lemon juice, cinnamon, clove, nutmeg, ginger, star anise, crystalized ginger, flour and salt. Take pie down and roll out into about a 12 inch round. Gently transfer dough to a parchment lined baking sheet. Mound the apple filling in the middle making sure to leave a 2 inch border. Gently fold the edges of the dough around the apples. Brush the dough with egg wash and sprinkle with turbinado sugar. Bake for 30-45 minutes at 375 degrees. Until apples are soft and crust golden. I love a good custard pie but never thought to add grapefruit juice and Campari to it. This recipe comes from The Four Twenty Blackbirds Pie Book. I was really intrigued by this recipe because for one, a creamy delicious custard pie. And two. I'm a big fan of grapefruit and love Campari--which took a while and was a love/hate relationship. But this custard pie was extremely delicious! Growing up I mostly had custard pies when visiting my relatives in Mississippi. It was the top pie that was at every get together and I would always look forward to it on the table. But maybe a year or so ago, I had it and felt that it was just toooo sweet! My taste buds have really changed and I could not believe I did not enjoy the pie as much as I thought I would. I literally had a big ole slice that I just took one bite of. So when I ran across this recipe, I thought, "win-win!" The perfect balance of sweet and bitter. I added some freshly whipped cream with serving to add another component of sweetness. Then, a syrup came to mind with grapefruit segments, blackberries and then a splash of Campari. The grapefruit and blackberries really added some texture to the creamy custard and worked perfectly. I hope y'all enjoy this light and refreshing dessert as much as I did! Preheat oven to 400 degrees. Blind bake your pie shell until lightly golden. 8-10 minutes. In a large bowl, whisk together the flour, sugar, and salt. Then whisk in the eggs, one at a time, until combined. Whisk in the melted butter, then the grapefruit juice, Campari, and heavy whipping cream. Strain the mixture into a large bowl and then whisk in the grapefruit zest. Pour the custard into the pie shell set on a rimmed baking sheet. Very carefully, transfer to the lower rack of the oven and reduce the temperature to 325 degrees. Bake for 35-40 minutes until the sides are slightly puffed and the center is wobbly but not watery. Make sure to not over-bake or filling will seperate. In a pot, combine the sugar, Campari and water. Bring to a boil then reduce heat to a simmer. Simmer for 3 minutes. Set aide and cool. Add the blackberries and grapefruit segments. There are two things that I just love. One of them being coffee--which I can drink all day long, and the other being pecan pralines. Combine them together and you have the perfect pick me up for breakfast. Combine them as a cool treat with chocolate covered espresso beans, well, now that is just sinful! Semifreddo has been on my "to do" list and I finally have gotten around the making one. Super quick to make and the perfect cool down dessert for the hot summer days or really any day. After they reached the internal temperature of 170 degrees, they are then whipped until cool, thick and doubled in volume. Adapted slightly from Epicurious recipe for semifreddo's base. Delicious and tasty! Line a sheet pan with wax paper and place aside. In a medium sized pot over medium heat, mix together the cream, sugar, brown sugar and salt. Put in your candy thermometer making sure the tip does not touch the bottom. Cook stirring occasionally until mixture reaches 240 degrees. The mixture will bubble and foam up during the cooking stage, but it is okay. Once 240 degrees is reached, take the pot off of heat and add the butter, vanilla extract, and pecans. Stir until it gets thick, then place a few spoonfuls of the pecan mixture onto your prepared pan with the wax paper. You should get 6-8 pecan pralines depending on how big you make the circles. Line 9x5x3-inch metal loaf pan with plastic wrap, leaving a generous overhang. Sprinkle almonds evenly over bottom of a pan. Sprinkle some of the crumbled pecan pralines and chocolate espresso beans on the bottom. Using an electric mixer or stand mixer, beat whipping cream in large bowl until soft peaks form. Refrigerate while the custard is being made. In a glass bowl, mix the egg yolks, coffee, sugar, and salt until well combined. Set over large saucepan of simmering water, making sure the bottom does not touch. Whisk mixture constantly until it is thick and fluffy and an instant-read thermometer inserted into mixture registers 170°F, about 8-10 minutes. Remove bowl and using an electric or stand mixer, beat mixture until cool, thick, and doubled in volume, about 6 minutes. Fold in chilled whipped cream. Transfer enough mixture to cover the bottom and then top with crumbled pralines and chocolate espresso beans. Tap loaf pan lightly to remove air pockets. Repeat with more of the whipped cream mixture, then pralines and espresso beans. Until you reach the top of the pan. Fold plastic wrap overhang over top to cover. 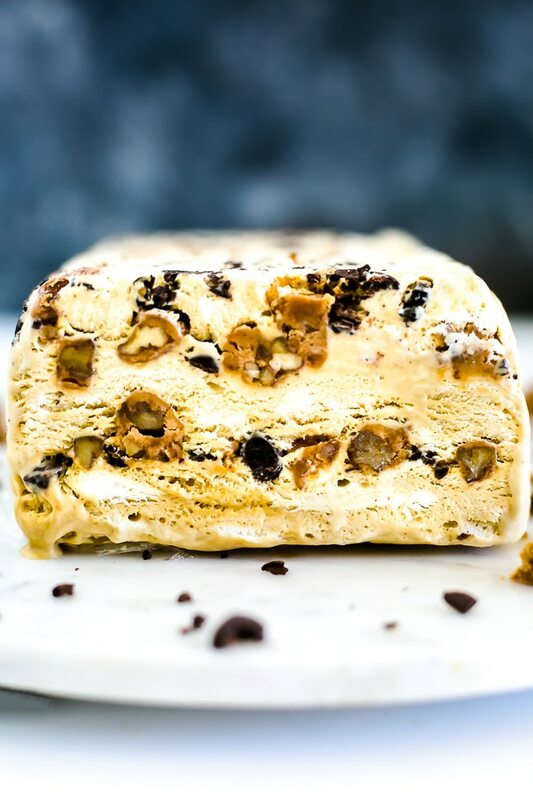 Freeze semifreddo until firm, at least 8 hours or overnight. This Strawberry Bread Pudding Souffle is a flashback from my first time stepping into a professional kitchen, Commander's Palace. I remember being so excited and buying my first knife roll--which I still have by the way! I was so nervous going into this establishment that has been around forever and holds so many accolades. For my stage, which is an internship in a kitchen where you work for a few hours for free, I was placed on the pantry station. Commander's Palace bread pudding souffle is their dessert that they are well known for. It is basically bread pudding that is broken up and folded into a meringue. Baked and then topped with a delicious whiskey sauce. It is strawberry season, so I wanted to incorporate strawberries into my bread pudding, because, why not!? How can you go wrong!? I went to my local grocery store and found brioche bread. I love how brioche is popping up all over the place! It is so buttery rich and delicious! Bread pudding typically is made with day old bread. You do not want the bread breaking apart and turning to mush! I decided to toast my brioche in the oven for around 15 minutes. I really wanted "in yo face!" strawberry flavor. For this recipe, I used fresh strawberries pureed with the heavy cream and diced strawberries to fold in. I was following the bread pudding recipe from Epicurious for Commander's recipe and altered it for the strawberries. My bread pudding was a little on the wet side, but keeping it in the oven for a few more minutes did the trick, without making it completely dry. This.Was.Delicious! I could not stop eating it. Especially with the whiskey sauce drizzled on top! Yes, please! Now, you can stop here and just cut some bread pudding pieces and serve with ice cream and the whiskey sauce, or you can go the next step and make the meringue. Either way, you have a winner! Oh, and this strawberry bread pudding recipe is an ease to whip up. Preheat oven to 350 degrees and butter six 6-once ramakins. Grease an 8-inch baking pan. In a blender combine the heavy cream and 1 1/2 cups of the whole strawberries. Blend on low until strawberries are pureed. Add the sugar, cinnamon nutmeg, eggs, vanilla and kosher salt and blend until combined. In a bowl, place toasted brioche bread cubes, heavy cream mixture, diced strawberries, walnuts and currants and toss together. Fold bread mixture in the custard base until combined, let sit for a few minutes for bread to soak up the mixture. Place bread mixture into the greased 8-inch pan and bake for approximately 25 to 30 minutes. You want your pudding to be golden. If a toothpick inserted in the pudding comes out clean, it is done. Make sure it is moist, not runny. Cool to room temperature. To make the whiskey sauce, bring the cream to a boil, combine the cornstarch and water, and add the mixture to the boiling cream, stir constantly for about 30 seconds. Add the sugar, bourbon, and salt, and stir. Let cool to room temperature. For the meringue, in a clean bowl of a stand mixture with the whisk attachment attached, add the egg whites and cream of tarter. Whip the egg whites until foamy. Gradually add the sugar, and continue whipping until shiny and thick. With a clean spoon, test to see if the whites stand up stiff like shaving cream. Make sure to not overwhip the whites or they will break. In a large bowl, break half of the bread pudding into pieces. Gently fold in a quarter of the meringue, being careful not to lose the air in the whites. Place a portion of this mixture in each of the ramekins. Place the remaining bread pudding in the bowl and break into pieces and carefully fold in the rest of the meringue. Top off the souffles to about 1 1/2 inches over the top of the ramekin. Smooth with a spoon and shape the tops. Bake immediately for about 20 minutes until golden brown. Serve with the whiskey sauce and enjoy! The meringue can be skipped and just the bread pudding and whiskey sauce made instead! Still every decadent and delicious. I started this blog 6 months ago and my goal was to continue learning and growing as a cook. Trying recipes that have been on my list to make for a looong long time. Wanting to learn how to bake and create yummy and tasty desserts. So for, I have been doing just that. I have brought more sugar and flour than I have ever in a whole year. Tart pans that have been collecting dust are finally being put to use. My Kitchenaid mixer if finally seeing the light again. 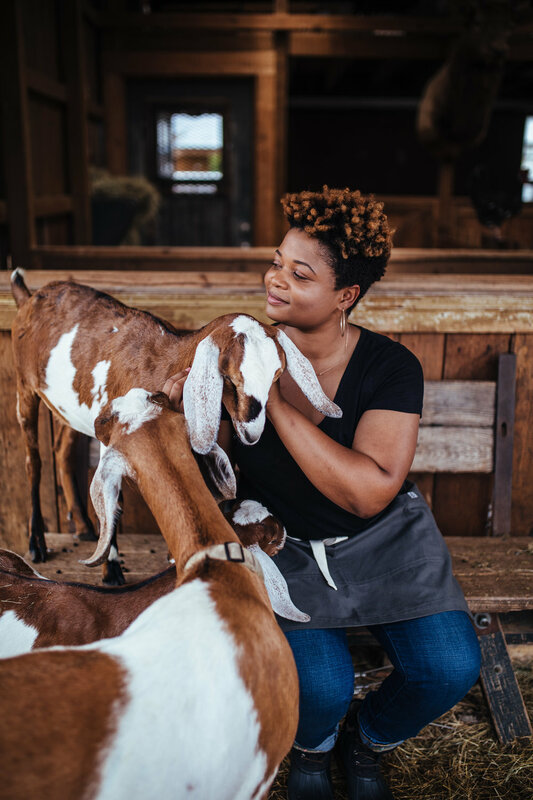 All in all, I'm having fun and loving the process and hope y'all are enjoying the recipes! This recipe was inspired by the super delicious Italian dessert, cannoli. I.Love.Cannolis! I remember at work buying them every day when I got off. Ricotta cheese? Really!? Who would have thought! They had the ones dipped into mini chocolate chips and chopped pistachios. I loved both and decided to make a tart with both! On Food and Wine, they had this recipe for a pistachio crust that I used. Blended up pistachios mixed with butter, flour, sugar, and a little almond extract never hurts! The crust was par-baked in the oven until golden brown. For me it was thick, maybe I did not even out my shell enough, but nevertheless it was extremely tasty and delicious! Next time I will do the trick of placing some dried beans over parchment paper to hold everything in place. If there is one thing I would want you to do for this recipe, it is to get some really good whole milk ricotta cheese. You taste a difference. Also, make sure you drain it overnight to release the liquid. The ricotta filling is quite simple and a breeze to put together. That.Is.It. Place it into a stand mixer with the whisk attachment and whip it up until nice and fluffy! For the chocolate ganache, I wanted a bittersweet chocolate. Something to balance out everything and give some bite. I used a 73.5%. If you want to follow an extremely informative guide on how to make different types of ganaches and the ratios, check out this link from The Kitchn. In the bowl of a standing electric mixer fitted with the paddle, beat the butter with the granulated sugar at medium speed for about 1 minute. Add the ground pistachios, almond extract and salt and beat until combined. Add the flour and beat at low speed until incorporated and the dough is crumbly. Place the dough into a 9-inch fluted tart pan with a removable bottom. Using the bottom of a glass or cup, press the dough over the bottom and up the side of the tart pan. Refrigerate for 30 minutes until chilled. Combine all ingredients for the ricotta filling into a stand mixer fitted with the whisk attachment. Whip for 2-3 minutes until everything if incorporated and nice and fluffy. Place into a container and reserve in the refrigerator. Once tart and ricotta filling is chilled. (You may need to let the filling sit out a bit to make spreading easier) With an off-set spatula, spread the ricotta filling into the tart shell evenly. Place in fridge, while you make the ganache. Place a small pot of water over medium-low heat. Place a glass bowl on top of the pot making sure it is not touching the water. Add your heavy whipping cream and chocolate. Stir slowly until chocolate begins melting and is incorporated with the cream. You want your ganache to be thick but still pourable to cover the tart. Take the tart out of the refrigerator and pour over your ganache making sure it spreads evenly across the top. Top with finely ground pistachios. Chill for 10-20 minutes. Enjoy! Steadily I've been getting more and more adventurous when it comes to desserts. Stepping out of my comfort zone, I created this delicious dish! Golden milk ice cream with cardamom spiced meringue! It is sooo good! The ice cream is coconut base and the meringue has cardamon in it, plus some chocolate action and toasted nuts going on, this is definitely going to up your game at the next dinner party. This recipe all came to light when I brought home some of Gaia Herbs golden milk mix. The main ingredient in golden milk is turmeric, which is an anti-inflammatory--so hey, this stuff is healthy for ya. I loved the color and was set on making some ice cream out of it! Golden milk powder can be mixed with almond milk or coconut milk, so I opted for the coconut base ice cream, which turned out extremely yummy! Other ingredients you can find in a golden milk powder is ginger, black pepper, vanilla, and cardamom. The golden milk ice cream recipe by itself is tasty if your time is short on making the meringue but definitely worth it. For the meringue shell, patience is the key. Low-temperature oven and a little over an hour and a half you have this light crispy meringue cookie. 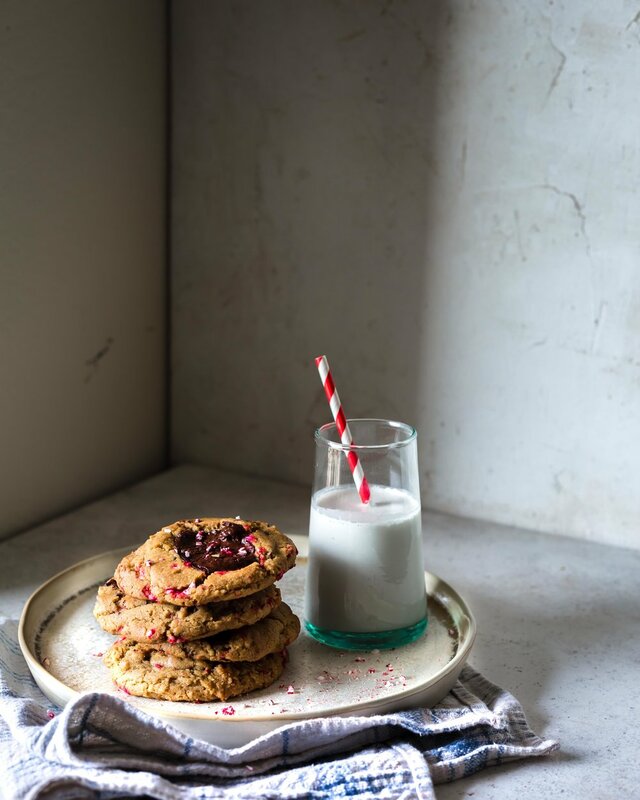 The added cardamon ties in with the coconut and turmeric and adds a nice spice to the cookies. In a medium bowl, whisk together the egg yolks. Slowly incorporate one-third of the coconut milk mixture into the egg yolks while stirring constantly with a whisk (not whisking) to temper the eggs. Pour the tempered egg yolk mixture slowly into the remaining coconut milk mixture in the pan, whisking constantly. Return the saucepan to the stovetop over low heat and cook, stirring until the custard is thick enough to coat the back of a spoon, 5-8 minutes. Pass mixture through a fine-mesh strainer into a bowl and refrigerate it for at least 2 hours but better if refrigerated overnight. Transfer custard to an ice cream machine and process according to the manufacturer's instructions. Remove ice cream from the machine and transfer to a container. Freeze for at least 2 hours. Line a baking sheet with parchment paper. In a stand mixer fitted with the whisk attachment, whisk the egg whites on medium speed for about 1 1/2 minutes until slightly foamy. Add the sugar, salt, cardamom and cream of tartar and whip on medium speed for 1 minute. Use a rubber spatula to scrape the sugar from the sides of the bowl, then continue whipping on medium speed for 8 more minutes, until all of the granules of sugar and salt have dissolved and the egg whites are still and glossy. Add vanilla and whip until combined. Grab a pastry bag or a resealable plastic bag and cut 1/2 inch off the corner. Place in a tall cup or measuring bowl and fold the wide end down. Use a rubber spatula to scrape the meringue into the bag. Gather your bag and gather the open end. Holding the tip of the pastry bag about 1/2 inch above the prepared baking sheet, twist the top and squeeze the meringue out and pipe a 2 1/2 inch wide round meringue. Should make around 8 rounds and make sure to keep them spaced about 2 inches apart. Dip a spoon in warm water and push down on the center of a meringue to create a nest. Repeat. Bake the meringues for 1 1/2 hours. To check for doneness, put a warm meringue on a plate that has been frozen for at least 30 minutes. The meringue should crisp up after a few minutes. If it doesn't, return the meringues to the oven for up to 30 minutes more, until crisp and dry. Once done. Add a dollop of the golden milk ice cream in the well of the meringue, sprinkle with chopped almonds, coconut flakes and a drizzle of chocolate sauce. Enjoy!! Why didn't anyone tell me panna cotta was so easy to make? Okay, let's forget about how easy and quick it is to assemble, why no one told me how tasty it is! Creamy, luscious and silky texture, yaas! I've seen Giada talking about it on Everyday Italian for years. I've had gelatin sheets I brought from Modernist Pantry sitting in my a drawer for months never used. So I finally made the leap to put them to use. Panna Cotta is Italian for "cooked cream" and basically is cream/milk heated, flavored and thickened with gelatin. I used gelatin sheets, but powdered gelatin can be used as well. This recipe is adapted from Cooks Illustrated, because how can they ever go wrong? This paired wonderfully with my pomegranate rosé syrup. 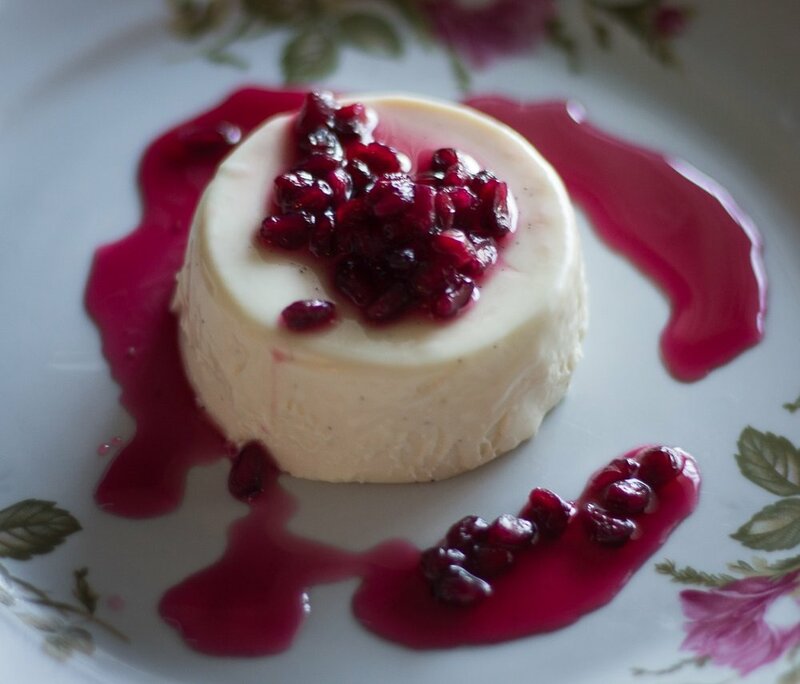 The texture from the crunchy, tart and sweet pomegranate seeds, with the creamy lemony panna cotta, was just the perfect mouthfeel. 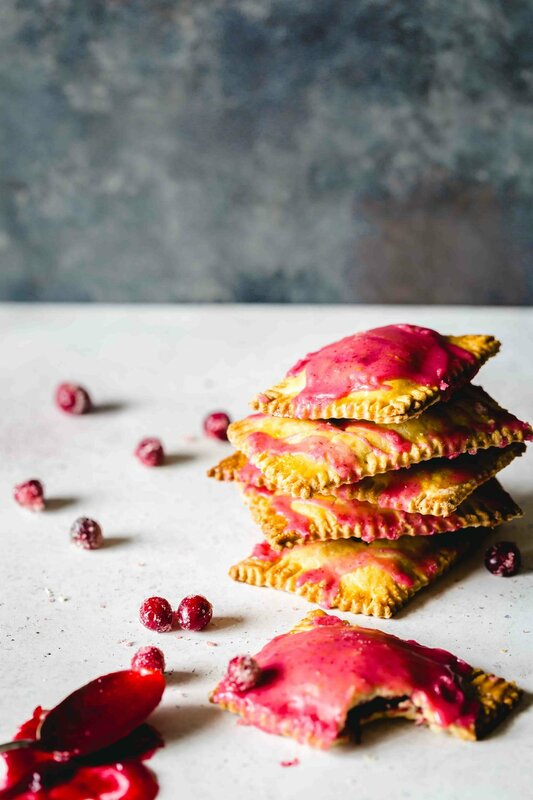 I cannot wait to make this again and use a fruit syrup that represents the seasons. I hope y'all enjoy this dessert as much as I did and please let me know! Gather your molds/ramekins and place aside. Take your cup of milk and sprinkle gelatin on top to let hydrate, place aside. Let the vanilla steep in the heavy cream and then add the milk with the gelatin to the pot. Heat until mixture registers 135 degrees on a thermometer. Remove from heat, strain mixture, then add lemon juice and zest. Stir and divide into ramekins. Place in refrigerator until set, roughly 4 hours. This praline sauce is highly versatile. Over ice cream, bread pudding, pancakes, brownies, on and on. I love how simple it is to whip up and who doesn't love pralines? They are these delicious sugar pucks of goodness that only includes a handful of ingredients: sugar, butter, cream, vanilla, and pecans. That is it. I used this recipe to go with my pumpkin pancakes.So easy to make, just combine all the ingredients in a small saucepan and that is it. I toasted the pecans to enhance the nutty flavor. Cooked until thickened and then served! Please, add some whiskey into it and really turn everything up! Now, that is what you would want to pour over some bread pudding. Enjoy! Cook and stir until sauce beings to get syrupy, about 4-5 minutes. Stir in pecans, vanilla, and salt. The brisk cool weather is upon us and pumpkins are over flowing the produce aisles. One of my favorite desserts--and probably one of the first desserts I made--was flan. The cold, silky, and creamy texture; paired with the bittersweet caramel sauce is a winning combo. The ingredients are those that are usually in the fridge and pantry--milk, eggs, cream, and sugar--so there is no going out of your way to make this. For this recipe I roasted the pumpkin until knife tender. Scooped out the flesh and seeds and then pureed it. It is super simple to do and to me taste way better than the canned variety. When time is short, go ahead and grab a can of your favorite canned pumpkin. I love this recipe because all of the ingredients can be combined into a blender. Then poured into the caramel glazed ramekins and right into the oven. One thing that is a must for custard base desserts is a "water bath". Basically you have one baking vessel inside of another baking vessel that has hot water placed in it. You benefit from this method because it applies gentle heat and adds moisture. Have you every baked a cheesecake and cracks developed? The heat and lack of moisture most likely caused this. The water bath helps to create a silky smooth texture as well. A great way to get rolling on pumpkin season with this wonderfully spiced flan! Combine the cup of sugar and water in a heavy medium saucepan. Swirl the pan over the heat until the sugar dissolves. Increase the heat to high and make sure to watch it closely and do not stir. Keep swirling the pan until a deep amber color develops;about 5 to 10 minutes. Have your baking dish ready and divide the caramel into each and coat the side.. Make sure to move quickly, as the caramel will harden up. Place aside into a large baking dish. Place the cream, milk, pumpkin puree, brown sugar, eggs, spices, vanilla and salt into a blender. Blend until everything is incorporated. Strain mixer through a strainer and then divide evenly into the prepared ramekins. Pour hot water into the baking dish until it comes halfway up the sides of the ramekins. Bake until flans gently set. You will want a little jiggle or you can temp them to 180 degrees. Once done, be careful when lifting the ramekins out of the baking dish. Chill until cold and serve.